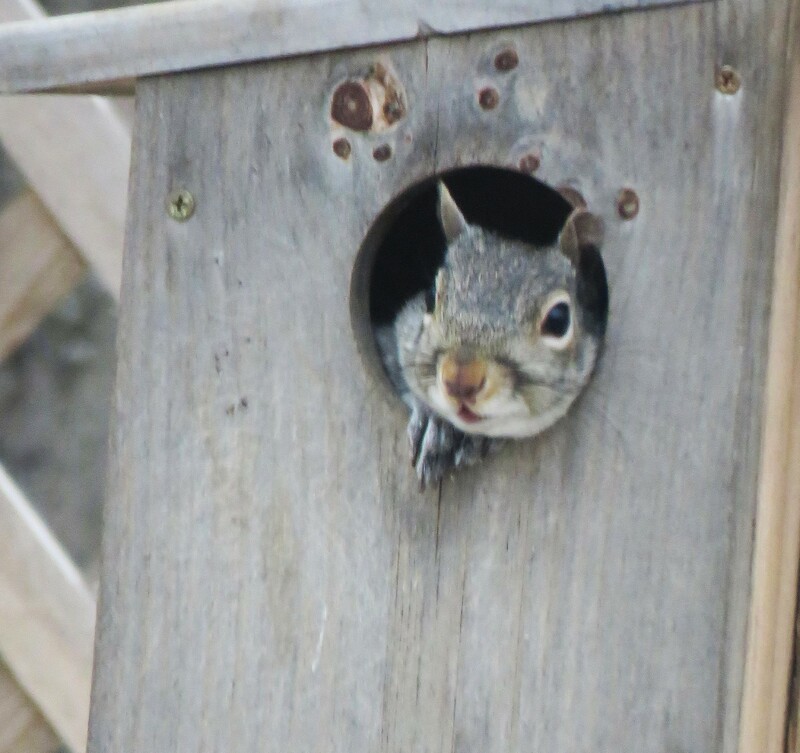 Eastern Gray Squirrels (Sciurus carolinensis) ignored last week’s icy duel between the seasons and continued full speed ahead with their spring home improvement projects. Gray squirrels don’t just survive in the midst of intense human activity and predation, they thrive thanks to their ability to adapt rapidly to changing situations while maintaining a healthy degree of wariness. It’s been that way for hundreds of years, going back to a time when gray squirrels migrated through tree tops in the vast unbroken hardwood forests of eastern North America. 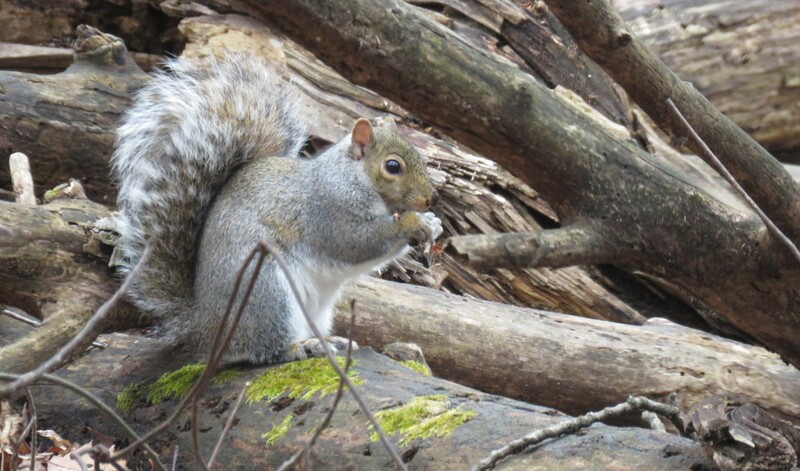 Gray squirrels greeted early settlers before they carved their open space niches into the landscape. Last fall, as winter approached, gray squirrels shifted into “overdrive” in their annual ritual of hoarding nuts in (mostly underground) caches, one of their finely tuned tricks of survival. 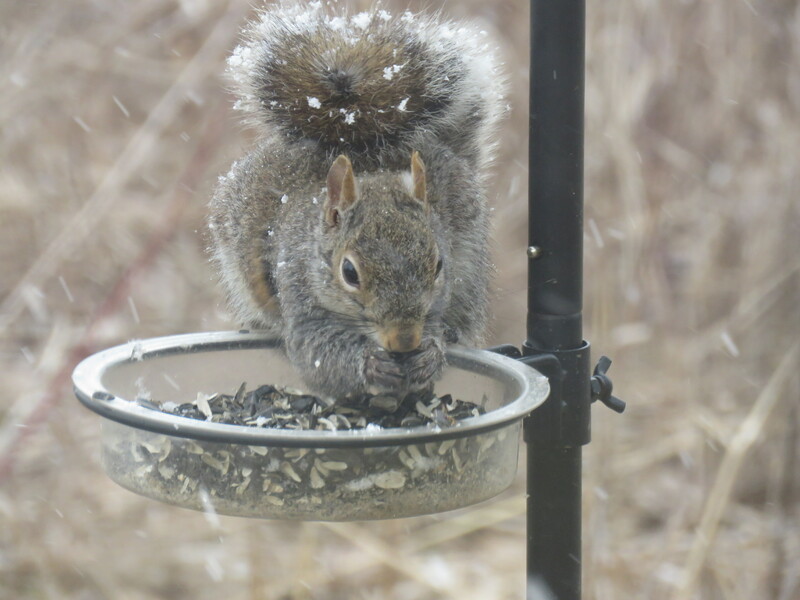 Food storage is critical for gray squirrels, unlike some of their rodent cousins, they do not hibernate. They will however remain in their nests during severe spells of winter weather and spring ice storms. When they are hungry, they descend head first down the tree to feast: a feat easily accomplished because of super flexible ankle joints that can rotate 180 degrees, allowing the claws to function as grasping tools that dig into the tree. With such an adaptation, they are truly the Olympic stars of the trees. Once on the ground they locate their caches by smell, debunking the urban legend that they memorized every location. As they scurry about sniffing the ground, neighboring gray squirrels pay attention to their behavior and often raid their nut caches. Some nuts are never recovered and will sprout into new trees. This leads to a new generation of oak, hickory and beech trees and adds to the natural rhythm of nature’s way on the Wilder Side of Oakland County. When watching them feast under bird feeders, squirrel life may seem carefree. However it’s often wrought with danger, even with their wariness and gymnast-like arboreal habits. Many fall prey to predators, with the Red-Tailed Hawk posing perhaps the greatest threat. Although gray squirrels can scamper along the ground at 10-15 mph, when crossing a field they can become easy pickings for the red-tail and to a lesser degree the sleek Cooper’s Hawk. Even with their ability to evade, escape, and act elusively, gray squirrels can be captured by red foxes, eastern coyotes, mink, weasels, and the common house cat – all masters of ambush attacks. Their crepuscular activities also make them vulnerable to attacks by Great Horned Owls and Barred Owls, especially when they loiter a bit too long at dusk. Northern pike will swallow gray squirrels too, a statement that may seem odd. It’s not, gray squirrels are excellent swimmers and will cross rivers and small lakes making them vulnerable to several species of fish, especially large pike. We are well into the breeding season of gray squirrels. Gray squirrels usually have have two litters a year, two to four babies in the late winter litter and sometimes a few more in the summer. The newborns are furless and helpless. They weigh about half an ounce, but grow rapidly and leave the nest by the end of their third month. Spend just a little time observing the behavior and antics of these squirrels and you will quickly discover they are far from boring. Some appear to be both insatiably curious and cautious at the same time as they peek inconspicuously from the far side of tree trunks to watch human territorial intruders. During last week’s ice/sleet storm, I watched one feasting casually on sunflower seeds under my feeder with its tail folded up over its body to shelter it from the elements. Although most nests are found in trees, they have no problem in setting up a nursery in a bird house with a large opening. I added a motion-activated wildlife camera to a nesting location and surprising discoveries unfolded. One night’s action-packed footage confirmed what I suspected: raccoons will climb trees or lattice works to prey on baby squirrels. The camera captured this dramatic, yet unsuccessful attempt in a 10-second video of a raccoon reaching into the nest box. The mother squirrel made frequent trips to the nest the night after the attempt and in the morning relocated her young. Gray squirrels come in in two major color phases: gray and black. A comment I hear with increased frequency is, “I saw a jet black squirrel!” Black squirrels are actually eastern gray squirrels with a genetic condition called Melanism. Melanistic gray squirrels are predominantly found in the northern part of the species range, (that includes Oakland County) where their darkness may be better suited to heat absorption in winter weather. 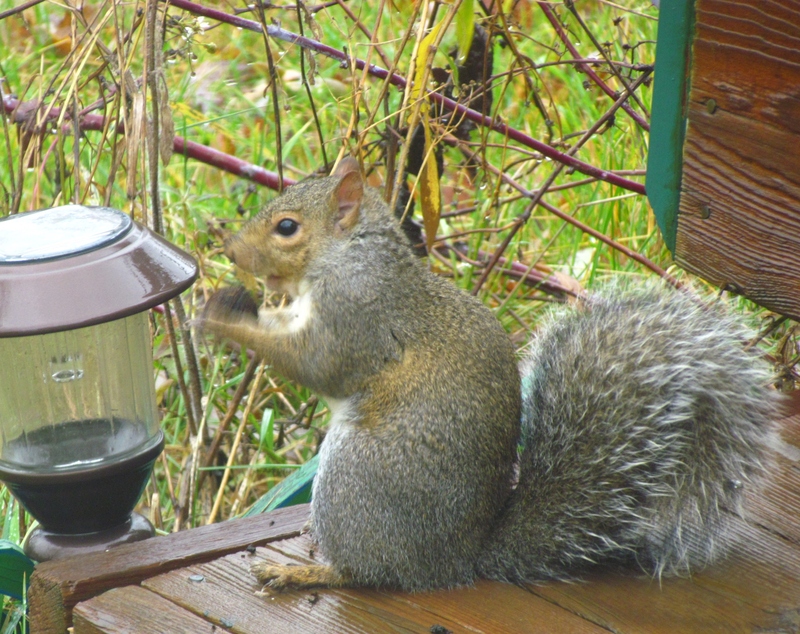 The diet of the gray squirrel changes as the seasons change, with spillage under bird feeders always on the menu. The season of abundant nut consumption is now coming to an end. In these early days of spring, they are slowly switching to the buds and flowers of oaks and maples and will soon search the forest floor for mushrooms, caterpillars, bugs and grubs. If they come across accessible nestlings, baby birds may become an entrée. Oakland County transforms into an all you can eat buffet during summer as they feast on winged seeds of maple trees, tree fruits, and berries of all kind, with a special fondness for black raspberries. John Burroughs, an early American naturalist and nature essayist, would watch the antics of gray squirrels at his Catskill Mountains home. He described them in his writings as “Elegant creatures, so cleanly in its habits, so graceful in its carriage.” I tend to agree with his observation as I walk in my woods and listen to their chatter. Sometimes I wonder if they are talking to me. ← Plan Your Dream Garden at a Greenhouse near You!